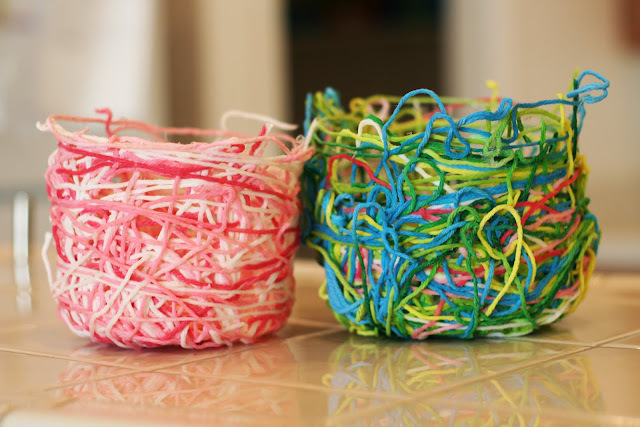 These yarn baskets remind me of my mom and all of the thrifty DIY projects that my sisters, brother and I would enjoy as each new holiday rolled around. It's simple and only requires a few basic materials. But, it's messy--which can be incredibly cool for your kids and a nightmare for parents if you're not prepared. So, cover the kitchen table with some newspaper or, better yet, take the crafting outside and enjoy the beautiful spring weather in the process. Turn a bowl upside down and cover with plastic wrap. Cut strips of yarn about 17 inches long. i don't know how many we cut, but it was a lot. Soak the yarn in a shallow dish of glue (we added a little bit of water to ours). Pull out strands and drape over plastic-covered bowl. After the bowl is covered with yarn, let it dry overnight. Remove bowl and peel plastic away from strings.